Cellulitis is usually caused by bacteria – specifically group A streptococcus (also known as Streptococcus pyogenes), Staphylococcus aureus (including MRSA), and, in young children, Haemophilus influenzae type B. The superficial layers of the skin are a very important mechanical barrier against infection. Cellulitis occurs when these bacteria, some of which are normally found on the skin of most healthy individuals, are allowed access to the deeper layers of the skin through some kind of lesion such as a blister or cut. In more severe cases the growth of bacteria and the body’s immune response to them may cause the formation of an abscess – a collection of bacteria and dead immune cells that form pus. While there are many kinds of bacteria that can cause cellulitis, identifying the specific offending organism is usually not necessary as almost all cases of cellulitis resolve with antibiotic therapy such as penicillin or erythromycin. If an abscess is present it must be drained before antibiotic usage or the infection will not resolve. Widespread infections may require hospitalization and intravenous antibiotics. Some individuals are at higher risk for developing cellulitis. This includes all persons with disease that impair the immune system such as diabetes or HIV/AIDS. People taking long – term immunosuppressive drugs for autoimmune conditions (such as psoriasis) or to prevent organ transplant rejection are more susceptible to developing this disease. Individuals who suffer from recurrent and/or chronic cellulitis infections despite treatment may benefit from prophylactic antibiotic therapy, which means that the patient would take low dose antibiotics daily to prevent infection from occurring in the first place. Measures can be taken to prevent cellulitis. This includes properly cleaning and bandaging all wounds, as proper wound care until the skin is fully healed. A physician should evaluate all deep wounds – not only to prevent cellulitis but also to avoid tetanus. It is very important to recognize and treat cellulitis as an untreated infection can progress to sepsis – a life threatening condition in which the bacteria gain access to the bloodstream and cause havoc throughout the body. 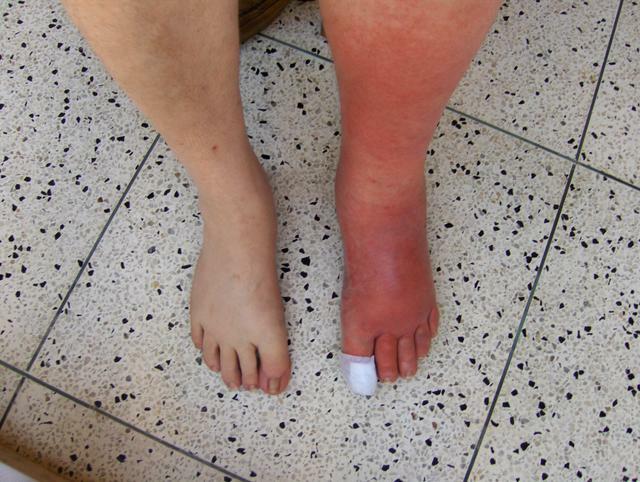 Cellulitis used to be a major cause of mortality following accidental injury. However, since the advent of antibiotics it has become a very easy to treat disease. If you or your child has suffers from the symptoms of cellulitis make an appointment with your dermatologist for evaluation and treatment.